Home WebDonuts Do You Mind If I…? Do you mind if I text and drive? Do you get the point of this comic? Here, the first person asks if he can smoke in the car. Now, smoking is widely recognized as something that will harm your health. In other words, there are risks associated to smoking, although they are not immediate risks. The second person uses the same structure of the sentence with the example of texting and driving. In the USA, for example, there are more and more people who create accidents because they have been texting while driving. So, by saying that, the second speaker is pointing out the fact that smoking is as dangerous as texting while driving. Do you mind if we read one more? 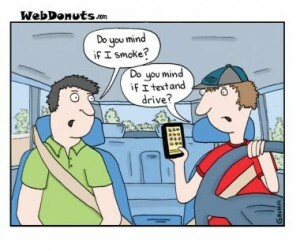 do you mind if, smoke, smoking, text and drive. Bookmark.